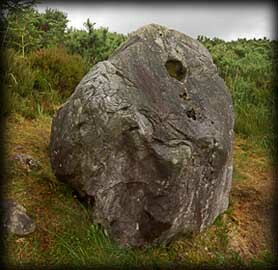 As you continue walking the Heritage trail at Bonane, immediately after the Fulacht Fia you will arrive at a very unusual Bullaun Stone. It is unusual in the fact that the large bullaun is on the side of the stone. It may appear natural at first glance, but it definitely has signs of being a man made depression. All around the bullaun are small drill holes, see image opposite. It is thought that the stone may face the winter rising sun. 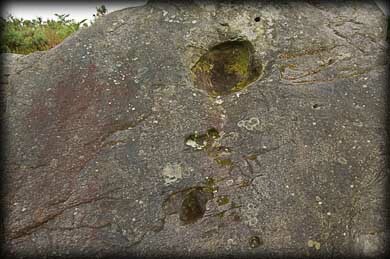 A far more interesting bullaun stone lies two miles south of here at Feaghna. Situated: Very easy. Located on the trail at Bonane Heritage Park. Discovery Map 85: V 9573 6552. Last visit July 2011.